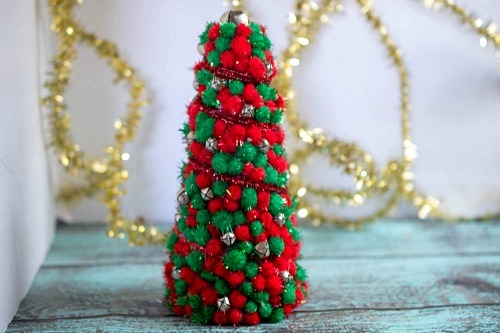 Pom Pom Christmas Tree Centerpiece Craft. I love decorating for Christmas! But I don’t love the prices on Christmas decor at the store. Luckily, I know how to DIY my own Christmas decorations! 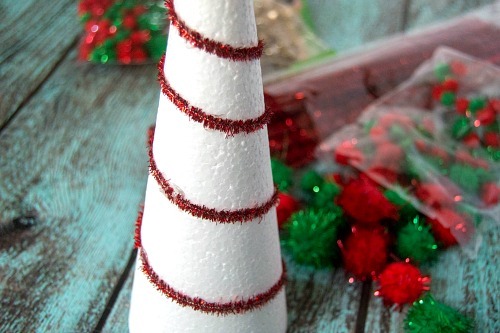 Making your own Christmas decorations is a great way to save money, and is a lot of fun! 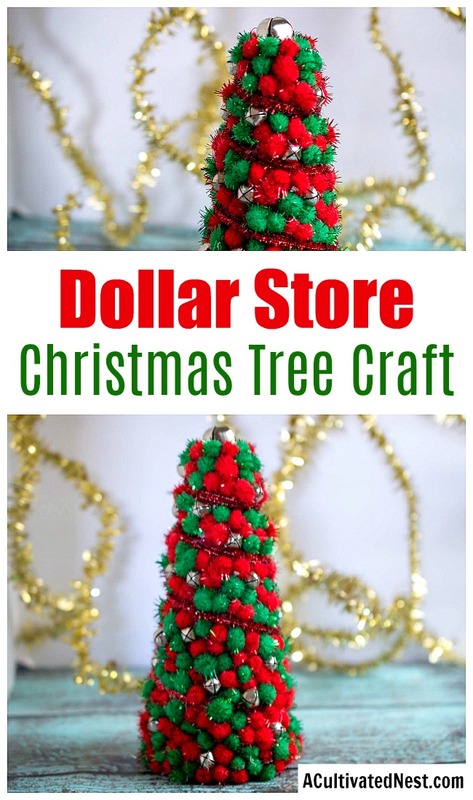 For a cute and inexpensive Christmas centerpiece to add to your decor, make my DIY Dollar Store Christmas Tree Centerpiece! I got all the materials from the dollar store! Making DIY dollar store Christmas decor is a lot of fun. 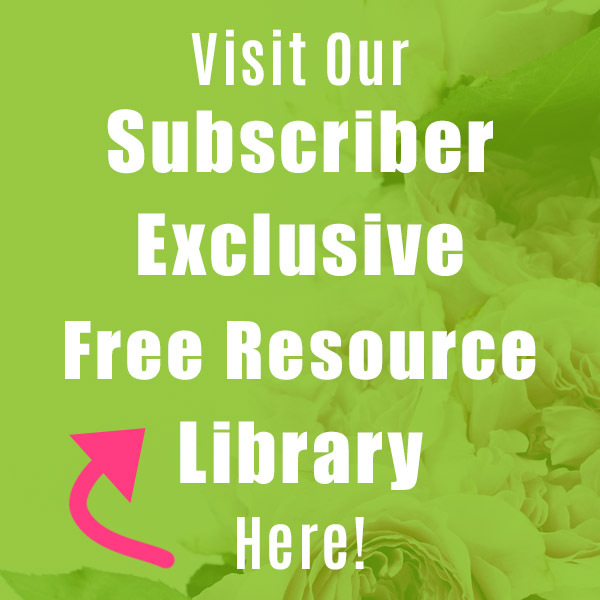 I make some homemade hot chocolate and turn on the Hallmark channel to let a festive movie play in the background (you can even stream the Hallmark channel from your computer these days!). Then I sit down to make my Christmas craft. 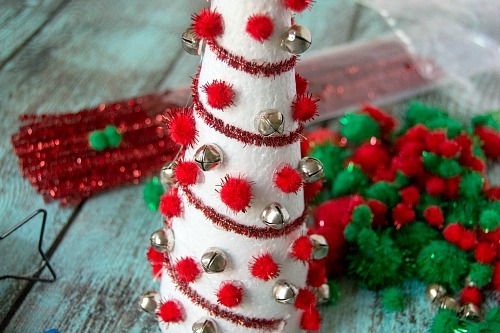 This dollar store Christmas tree centerpiece is even easy enough that the kids could help you (if they know how to use a hot glue gun safely). 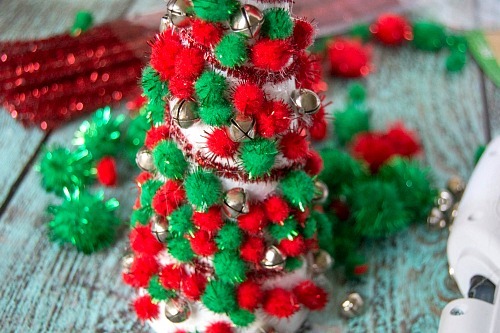 So take some time out of the busy holiday season and relax with this Christmas DIY! I got all of my materials at my local dollar store. 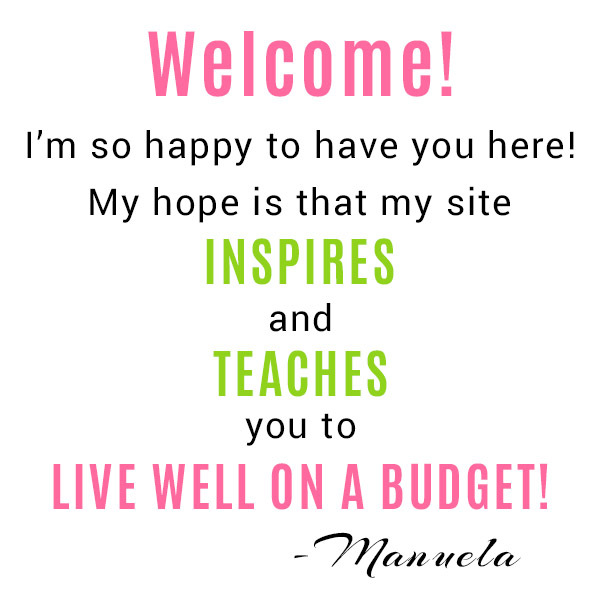 You can also check Walmart for inexpensive craft supplies. *There isn’t going to be an exact amount of pom poms or bells. If you like more bells covering your tree, add more! You can also leave the bells out completely if you wish. 1. 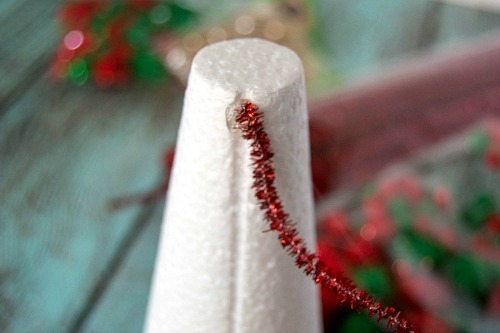 Glue a pipe cleaner to the top of the cone. Begin to wrap it around the cone downward, at a slight angle, adding glue now and then as you go. Add another one until you’ve reached near the bottom. 2.Glue bells in various places all around the cone. 3. 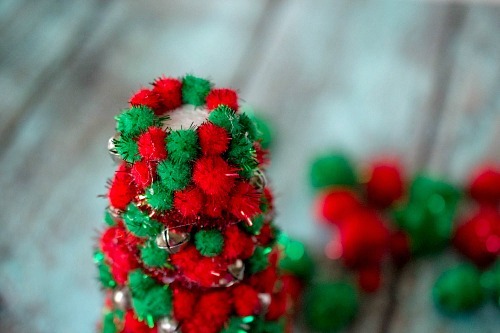 Begin to glue pom poms all over the cone, alternating colors as you go. 4. Once your tree begins to get full, go over the pipe cleaners with a second one on top, gluing and following the ones that are already there. 5. 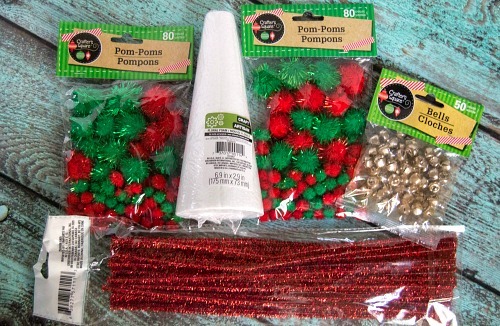 Continue gluing pom poms until you can no longer see the white cone. 6. 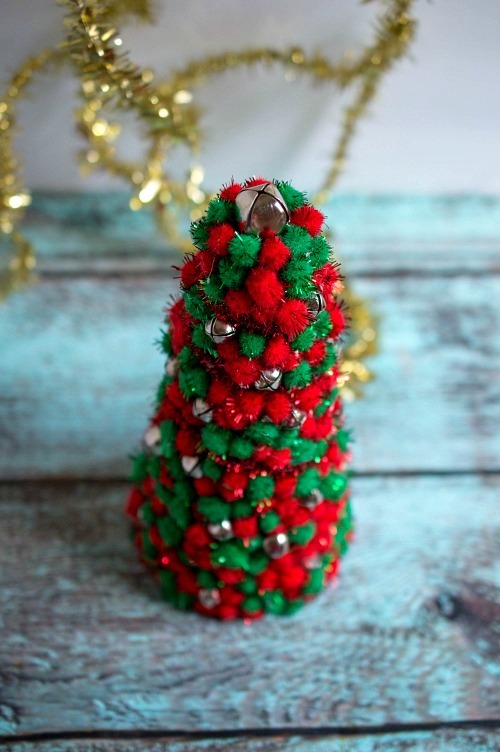 Add pom poms to the edge of the top of the cone. 7. In the remaining space on the very top, glue the larger bell. 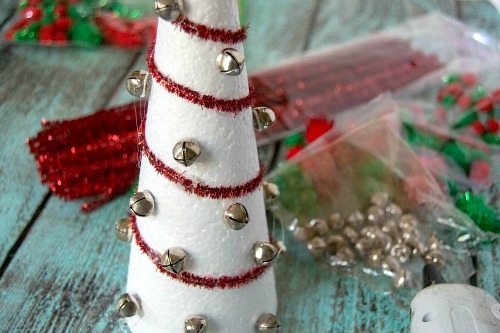 Then your DIY dollar store Christmas tree centerpiece is complete and ready to make your home festive! 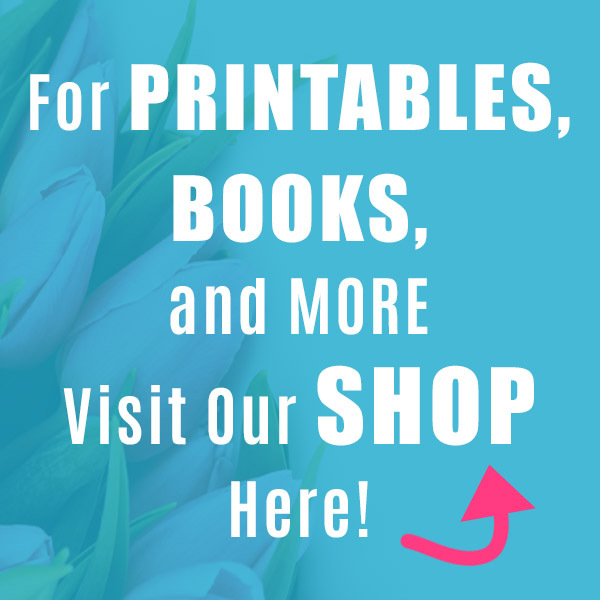 Add it to your Christmas table’s centerpiece, or put it on top of your fireplace mantel or end table. You could even make several of them (maybe in different sizes!) 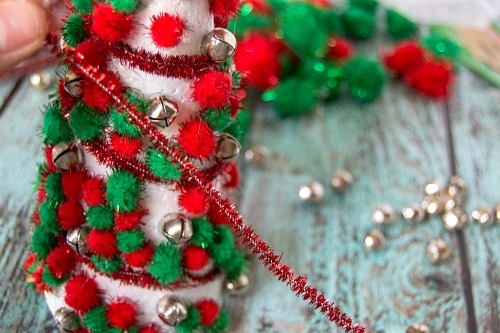 and create a little Christmas pom pom forest! Is Christmastime a big crafting time for you? 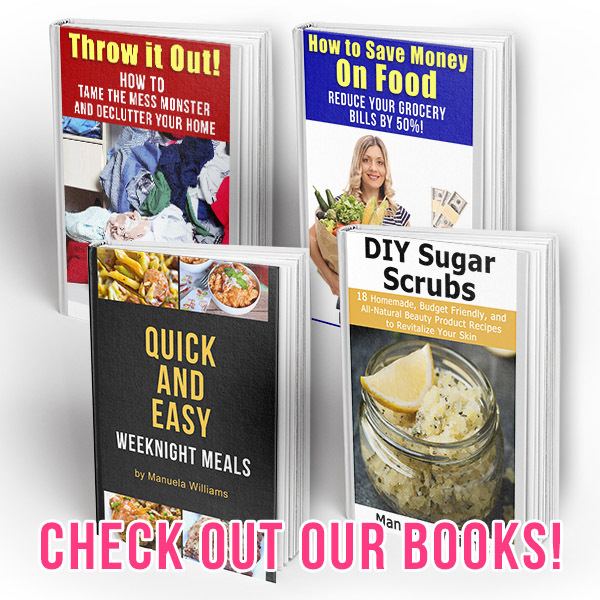 Do you tend to make more DIY decor or DIY presents? Oh this is so cool. It would be fun to try this out .christmas is just coming and i am planning to doing something special for my kids.